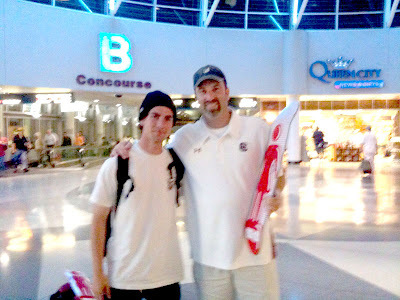 On my way back from Los Angeles recently, I was honored to get to sit beside an amazing pro-skater. His name was Mike Mo Capaldi. Not only is he an amazing athlete, but he was an even nicer kid. While talking with him for probably 30 minutes longer than he wanted to (due to his Nyquill pills he had taken), he actually asked if I wanted to give Walt, my six year old, one of his name-brand boards. He had carried a few on the plane with him. He was even nicer when I was bold enough to tell him I could never go home with just one, since I had two kids! His skate company is named, "GIRL," which I knew Savannah would love to hang in her room, because their logo is like a lady's restroom symbol. She flipped out over it. Above is a picture in the airport of the two of us after our flight. Below is a picture of Walt with his seventh birthday gifts on. 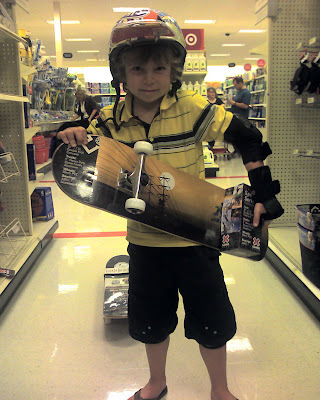 He insisted on having a new skateboard that he could use, since the Mike Mo board has Mike's autograph on it! Mike Mo Capaldi is set to be featured in the newest Tony Hawk video game. Look out for this kid, he is the real deal!